Special Discount Call Us Now! Trekking to Crater Rim Senaru 2 days 1 night Group package, start via Senaru village to Crater Rim and the 2nd day back to the Senaru village. 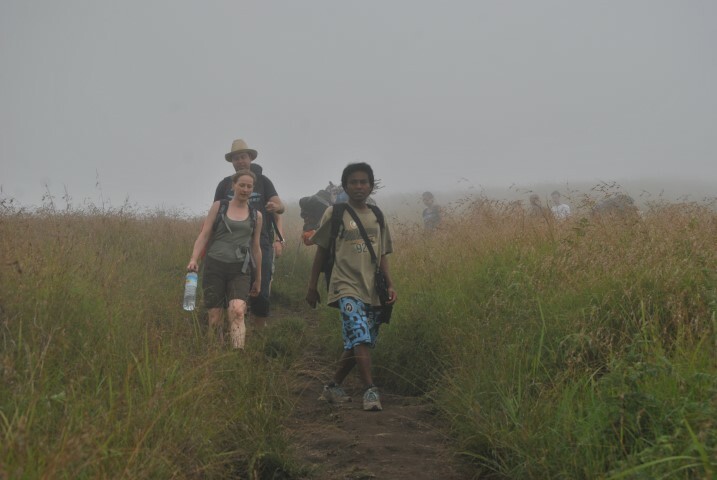 This program is the famous trekking package to Mount Rinjani and suitable for beginner trekkers. Hiking Crater Rim Senaru 2 Days, Sharing Package design with maximum 6 person trekker lead by two person guide and six person porters in the group, our group only for people booked in same date, package and same price at our company not share with other hiker from other company. Note : 6 Person trekker in group is maximum number of participants and if only two or four person booked the group package in same date we guarantee we do organizing them to climb Rinjani with ratio the guide and porters lead them here. Arrival day : The Day You Arrive at Lombok Praya Airport , or any others port in Lombok as Bangsal harbor ,Teluk Kodek, Telok Nare or maybe from any main object tourist in ( Mataram, Senggigi, Kuta Lombok ) we will come to pick up by our representative staff, then transfer to your hotel in Senaru. Senaru village is our based where is the place you can meet with your Rinjani trekking guide and porters then will free briefing and explain the trekking procedure and prepare for your trips and if we have time we will guide you visit waterfall Sindang Gile for warming up before climb to Mount Rinjani next day. Registration at the Rinjani Trekking Centre pos 1 Senaru village (601) our trekking tour is begin at 7.30-8.00am in the cool morning ,the first 30 minute we walking are in the open views, and green plant of coffee tree, bamboo, and a many others of the plants belong to the local peoples in Senaru can be seen, we pass walk 30 minute then we reach the gate of the tropical rain forest, short break for 10-15 minute. Then we continue our trek through the jungle where we will shadowing by the sun, walk in the humid temperatures and its will protecting us from the sunshine, a long the way up we will see and found many big trees sound of the animal monkey black/brown monkey can be see and hear, three hours approximately we walked then we will reach and found pos 2(1.500m) it called pos MONTONG SATAS where we can do break and lay down to recover our energy while waiting for our guide and porters prepare soft drinks crackers and fresh fruits, banana, pineapple will be serve here. Its time to go now!, we still in the middle of the tropical rain forest, to get to pos 3 need time approximately 2 hours and during the trips we will find and see the local strawberry it growing long the way ( June, July, August it season), two hours approximately we pass pos 2 then we arrive at pos3 (2.000m) which called MONDOKAN LOKAK where our porter and guide do cook for our lunch here fresh fruits and biscuits snack will be serve here ,be ware ! here there many brown monkey live here some time they will stealing your small backpack so make sure don’t leave it a way from you. After 1,5 hours we do rest here then we will continue to CRATER RIM (2.641m) first 25 minute we pass the Mondokan Lokak then out from the tropical rainforest so we walk on the Savanna on the hills with open views then the trail quite steep but the beautiful scenery of the 40% over Senaru village taking break we called CEMARA LIMA and then we go further to Pelawangan 1 Senaru Crater Rim (2.641m) for about one hour to get there camping and over night with own dinner here, the trail are stony and quit steep up, and you will find great moment of your life from senaru Rim views:- Spectacular sunset over the 3 Gilis and mountain Agung in Bali- Sun rise from next to the valley of mt. Sanggka Reyang- Smoke that throughout hole of New volcano or Gunung Baru Jari in the middle of Lake Segara Anak- Peak of Rinjani mountain 3.726m- Best sleep under the star. After breakfast and enjoying the sunrise, and taking the picture with beautiful scenery of the lake we will go down to Senaru village for 4-5 hour back down and including break and lunch on the way between pos2 or pos extra ,then we will arrive at senaru Rinjani Trekking Centre around 12.30am to 13.00 then our private car will transfer you to your next destination. 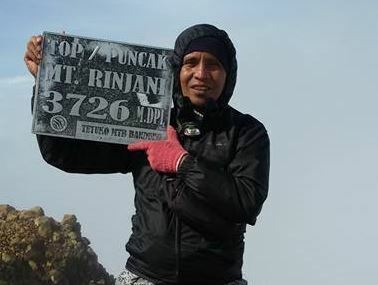 Trekking Cost Rinjani 2018 visit Mount Rinjani trekking package price page for detail information. Entrance fees to the national park and Sendang Gile waterfall. Transfer at the conclusion of your trek within Lombok island. Transfer by public boat to Gilis ( Trawangan, Meno or Air ). We will pickup from any location within Lombok island at last 11.00 pm one day before the trekking day and transfer after from the mountain by car with air condition to Airport at Praya, Mataram, Lembar harbor, Senggigi, Telok Nare, Bangsal, three Gili island (Trawangan, Meno or Air), Tetebatu or Labuhan Lombok. Extra Charge 10 USD for pick up or transfer from/to Sekotong in west Lombok and Selong Belanak in central of Lombok. At arrival day will sleep in Pondok Guru Bakti or Pondok Indah or Shambhala Rinjani Homestay in Senaru is a comfortable, clean hotel with private facilities with maximum 2 people in a room. We camp for one night during the trek in tents maximum for 2 person, Not sharing with other trekker on your trek in a tent. Mineral water 3 liters a day, soft drink ( coke,fanta etc ) and 3 time a day tea, coffee and milk. Alcohol drink not available. Detail foods and drinks on the Rinjani expeditions here. Your Group trip will be led by Local Senaru experienced guide and fluent in english. Our guide are selected for their experience in Mount Rinjani National Park. You are in very safe hands with SYAM TREKKER. 1. Total cost per participant 165 $ US and required minimum 2 participants join this package. If you need more information about Group Package 2 days 1 night trekking crater rim Senaru Mount Rinjani via Senaru please contact us. Pre-enquiry for reservation or check our trekking schedules via email or use email form bellow. Copyright © 2015 All Right Reserved - Rinjani Base Camp.